The radiation intensity is growing up. The reason is not only a hole in the ozone layer. Today we are more and more faced with a new kind of radiation, the information radiation. Sources of this kind of radiation are Radio and TV stations, Print Media, Newsletters, Social Networks, E-Mails, etc. The solution is not to build up a protective shield but to find out the right filter mechanism which brings the needed information directly to us and suppresses information which cannot be absorbed due to a limited retentiveness. Searching is one of the most frequent activities people do on the web, yet a great many web sites deal with their search engines in a haphazard way. This is a sorry state of affairs that a great deal of people has been traumatized with poorly organized websites, and a lot others has begun to perceive browsing as a nerve-racking experience. Your website may be a paragon of elegance, and design but whether it facilitates the browsing of its visitors is a crucial dimension of your success on the web. Nothing else counts more to your website than the incorporation of a good search tool, and quality search results users so earnestly look for. An important step to use information effectively is to first summarize them and then, if needed, go into the details. Blogs are invaluable information resources and great communication tools. They allow you to share and learn as you go and reach out to interested people outside your regular circles. As useful as blogs are, a great deal of accumulated information is lost in the growing archives. Blogs are structured to provide only the most recent information. It is far less convenient to find what you need when you have to dig back for information from older posts. This is especially significant when you have authored hundreds of posts over a period of time. In this case, having a tool to organize your information into a handy knowledge base will give you easy access to all of your blog posts in the context of your search. A company providing summarized contents is Content Discovery Inc., Canada represented by Henry Lewkowicz whom I got to know via LinkedIn a couple of weeks ago. This article describes a new approach to summarize content of blogs by using the technique of Mind Mapping supported by a computer generated database. Enter your credentials for allowing BlogSummarizer to access the contents. The creation process starts and analyzes the blog. After a few minutes a knowledge base is created which serves as the basis for content visualization. BlogSummarizer uses tags, categories, and part of the content of each article to build up the knowledge base. Here is the result for my blog http://iNotes4You.com. There are different options to retrieve information. Content summarization can be displayed as a visual map, a tree view, or a keyword cloud. 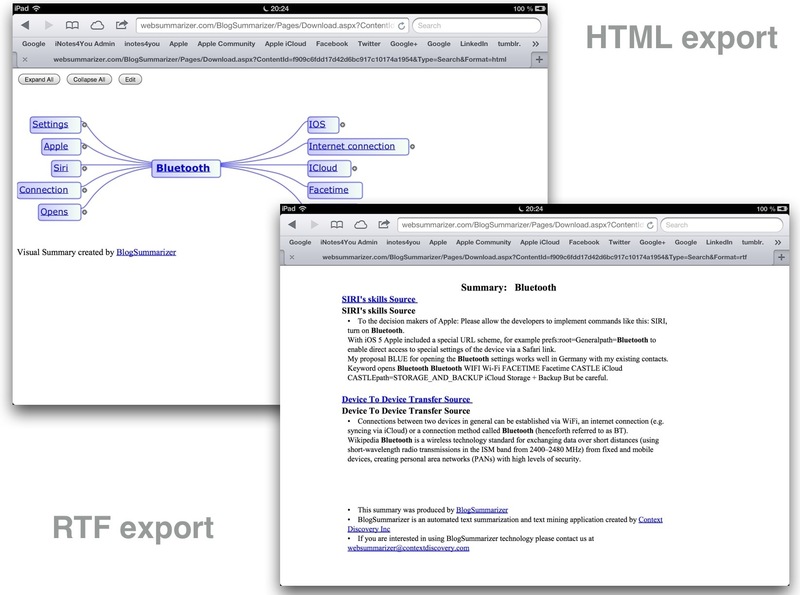 The image shows the summarization result in HTML and RTF file format. 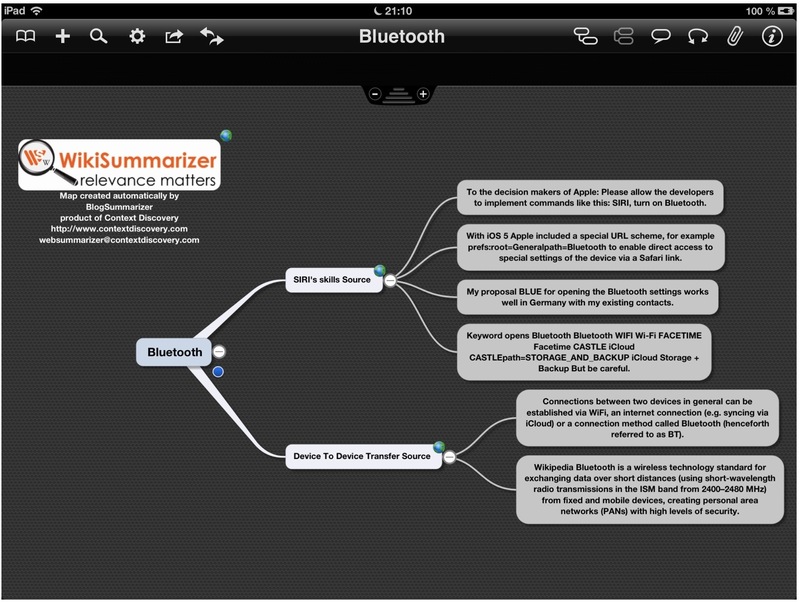 This is the mind map automatically created by BlogSummarizer after entering the keyword ‘Bluetooth’ and exporting the result to the iPad mind mapping tool iThoughts HD by Craig Scott, UK. Look at the branches of the map. In the upper right corner you find globes which indicate links to the corresponding blog websites. To open the website just Tap and Hold. This is an excellent feature of BlogSummarizer which strikingly increases the visualization of information. To make the information of hundreds of blogs accessible the generated knowledge base is a helpful aggregation of data to point out content. But this works only in an effective way, if the authors know the STRONG aggregation rules and assign the right keywords and tags to each article. So the generation process may not effectively work for articles written in the past. Readers of WordPress.com blogs can use the full text SEARCH function, the combobox CATEGORIES as well as the KEYWORD CLOUD to display related articles. That’s all. The results are always a listing of the complete articles containing the keyword as a tag or category. It would be more effective to present a list of headlines and excerpts. 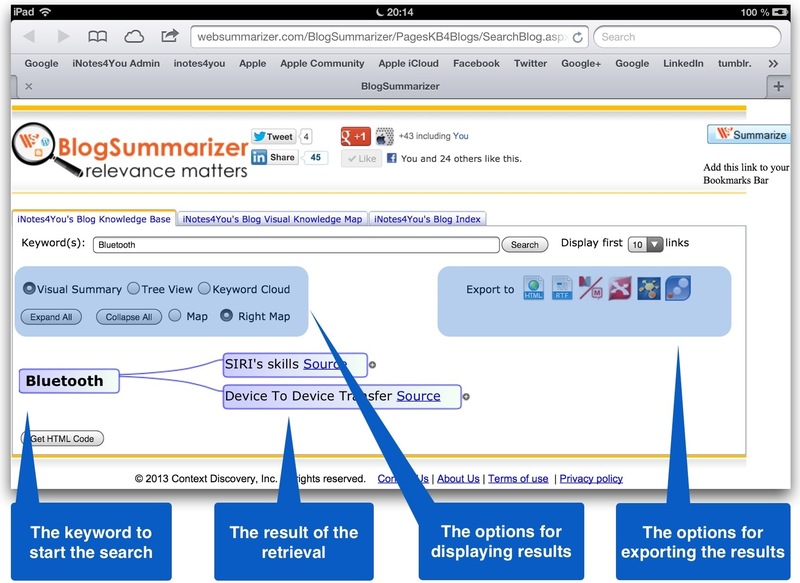 BlogSummarizer supports the search process in a more user-friendly way by offering a Mind Map, a Tree View, and a Keyword Cloud containing links to each article. So it can be seen as an additional support for search processes. We talked about different supported platforms but mind maps need a lot of space when expanded so this visualization of content is more often than not usable for devices with tablets and smartphones. But the most important point is that articles at the time are not written with the focus on searchable results. So I think the only way to optimize the search results and provoke the acceptance of users is to always keep the algorithm in mind which summarizes the content. Content Discovery has to make the authors aware of the rules of generating the knowledge base so that they can be taken into account when writing articles. A listing of headlines with publishing dates, tags, categories, and excerpts should be offered. At the time I myself created a database on the iPad using the app TapForms to get this list. To each article a priority rating should be taken into account when generating the knowledge base. This rating should be used as the main sort order and a criterion for highlighting. The ‘Strong, Normal, Weak’ classification of keywords (number of mentions in articles) is in many cases not the conclusive statistical value for importance (e.g. keyword ‘app’ in my blog). BlogSummarizer should also be available for WordPress.COM blogs and not only for WordPress.ORG blogs. At the time a suitable HTML-Code cannot be inserted in WordPress.com blogs due to security guidelines of WordPress.com. If you try to insert HTML code it’s immediately stripped off when saving the article. Today the acceptance of new techniques is more and more a question of how it is presented. In the last months several Social Networks like Twitter, LinkedIn and Tumblr made strenuous efforts to develop user-friendly interfaces. Apple’s guidelines should be valid for all apps as well as websites. So the layout of BlogSummarizer’s website has to be reviewed. At the time it’s not what users expect. BlogSummarizer should offer some options e.g. ‘Include words in headlines’. On 2012-11-25 I published an article with the headline ‘Using an iPhone in Thailand’. BlogSummarizer reports ‘No search results’ after entering ‘Thailand’ as a keyword. Tablets are gaining popularity and it’s likely that more and more information is retrieved by using these devices. As a consequence there must be an APP which is able to provide summarized information for tablet users. The app should offer an integrated browser. Enter an URL, open the menu, enter keywords and start the summarizing process. 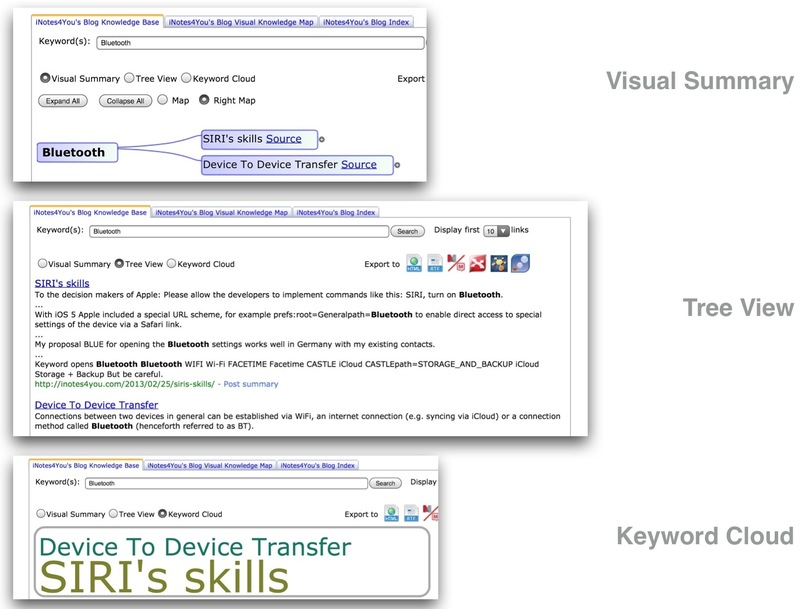 The result is displayed as a mind map with some options not shown in the example like ‘Display as Tree View’ or ‘Display as RTF’. In ‘Settings’ one of some supported mind mapping tools can be selected. To get information from multiple websites a branch should be created for each website. 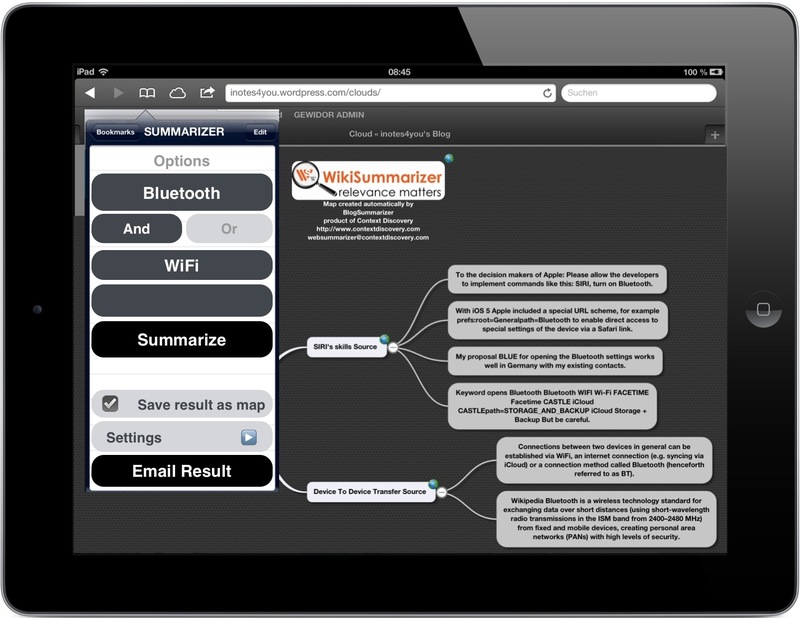 After finishing summarization the mind map can be transferred to a mind mapping tool to further work on it. Anyway BlogSummarizer is on the way up. All the best to Henry Lewkowicz for future developments. Please feed the blogger Thomas with positive or negative comments to either make him proud or force him to improve the quality of his articles.